Wildlife photographer Jak Wonderly traveled to India in January 2018 on a photographic expedition. 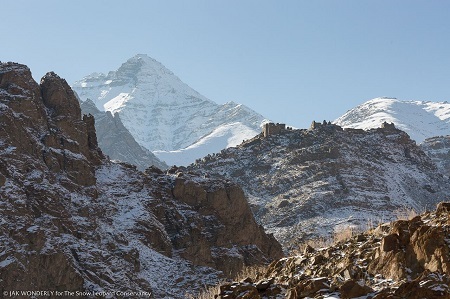 Read about his amazing adventure as he searched for the elusive snow leopard. The eight thousand mile journey had brought me to the base of a 71-foot golden Buddha. It was near the Stok Monastery in Ladakh, India, that we left our vehicle, strapped the camping equipment to the backs of ponies, and began the walk into Hemis National Park. With equal parts excitement and trepidation, I hiked into the colossal landscape. 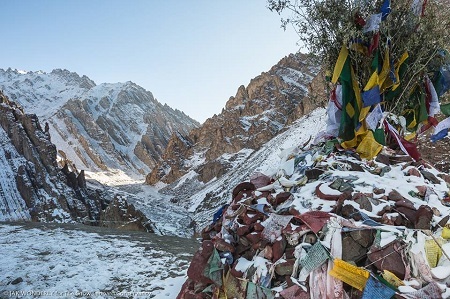 The trail – where there was one – was often marked with prayer flags and rock engravings of stupas. Setting off on this adventure, I didn’t know how my body would handle the altitude as we climbed as high as 14,000 feet. More concerning was the weather forecast; sleeping in a simple tent with temperatures projected to be as low as -20 degrees Fahrenheit seemed downright dangerous, but I trusted my team and was driven to find the Grey Ghost. I had been fortunate to photograph all the other big cats in the wild, and I expected this expedition to be the most difficult. When I woke the first morning in my tent, everything inside was covered in frost. Most of the battery-powered equipment would not turn on. Anything liquid that wasn’t inside my robust sleeping bag was frozen solid, including my sunscreen and contact lens. 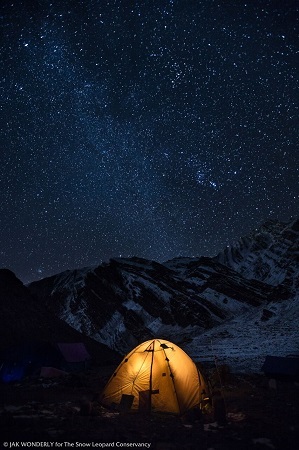 But my fingers and toes still had blood flow, and when I stepped outside my tent in the pre-dawn hour, I was treated to an incredible starry sky with snow-capped peaks all around. Snow leopard camouflage is legendary; we spent ten hours a day climbing to vantage points and studying patterns of light and dark on the mountainsides, hoping to see the flick of a tail or the twitch of an ear. 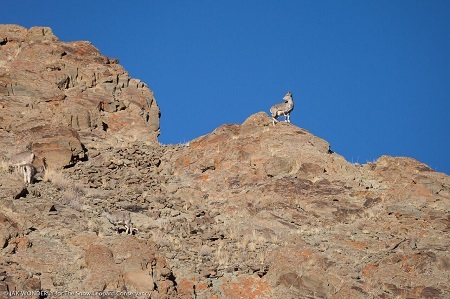 Occasionally we would spot blue sheep on a distant ridge – a staple of the snow leopard diet – or a golden eagle circling high above. With fourteen hours of darkness each night huddled in my tent and no electronic distractions, my imagination incessantly spun scenarios of spotting a leopard in the vast Himalayan landscape. After a few days, we discovered leopard pugmarks in the snow. The tracks were considered to be a couple of days old already, and as the Grey Ghost can travel 25 miles in a single night, there was no point in attempting to follow them. But to see the paw’s outline in the crystalline snow and know that my path had crossed with hers made the already exhausting journey worthwhile. We hiked further and higher each day. 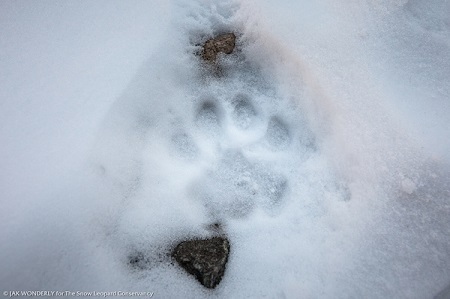 We discovered the tracks of what appeared to be a mother and two cubs, but again, the tracks were not fresh. I tried to remain patient as the number of days left on my expedition was down to just a few, and we had not yet seen a snow leopard. On the eighth day, we decided to try our luck in a new location. As soon as we hiked back close enough to civilization to get a cell phone signal, we contacted Jigmet Dadul from the Snow Leopard Conservancy India Trust. He had exciting news; reports were coming in from a remote village that a snow leopard had killed a yak during the night. With goose bumps, I ended the call, and we trekked quickly back to the roadside where we met with a Jeep and made the treacherous three-hour drive to our new location. When we arrived, I learned that the yak was a livestock animal belonging to one of the six families in the village. 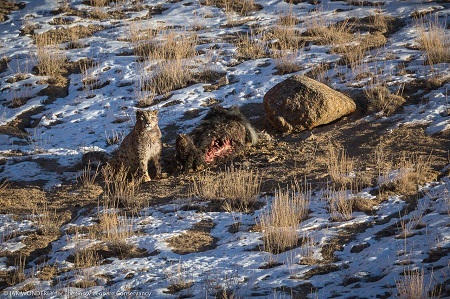 Snow leopards preying on livestock are a serious problem. Retribution killings by farmers and herders are not uncommon; this would be a tragedy, but I could understand the motivation. Loss of livestock to predators is a real threat to a family’s food source and/or finances. Despite a group of expert spotters, it wasn’t until a boy from the village pointed out the ridgeline where the cat was last seen that we finally got a glimpse of the Grey Ghost. I saw a grey rock in the golden sunshine among many other grey rocks and some brush. But this one was a little softer around the edges. And then it lifted its head and looked directly toward us. She was beautiful, darker than I had expected, and being back lit by the early afternoon sun gave her the appearance of having a small mane. We measured her at 600 meters away, much too far for a clear photograph, but I was ecstatic that we had finally gotten a glimpse of this elusive creature. After a few minutes, she stood up and went down the opposite side of the ridge. I was afraid that was the last we would see of her but tried to trust she would inevitably come down to the yak. Finally, as the sun fell behind the jagged mountains, she emerged from her perfectly camouflaged perch among boulders and sauntered down towards the yak. But the light was much too dim for photography, and we returned to the village with hopes she would still be present in the morning. We arrived the next day well before the sun was up, walking in near blackness towards the kill site because we considered using flashlights to be potentially disruptive to the leopard. 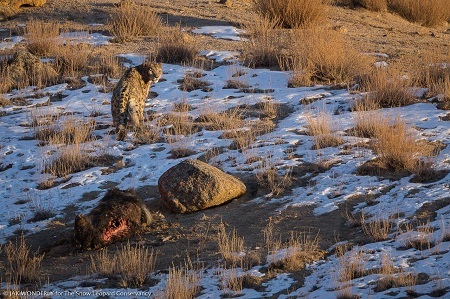 We set up a blind about 200 meters from the yak, and as the daylight crept up, I could make out the snow leopard sitting right next to the carcass. 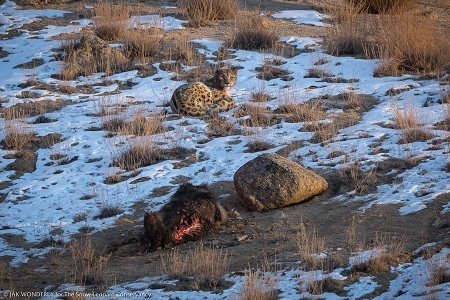 Since at long last we had located the leopard, most of the team retreated so that there would be minimal noise and movement bothering the cat. During the day, when the harsh light made photography difficult, I inquired about the loss of the yak and interviewed the farmer it belonged to. A yak of this age would probably be worth $150 USD, several weeks if not several months of pay for people in this region. 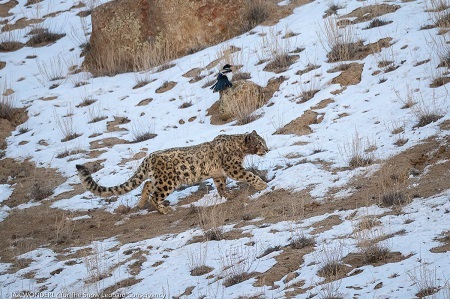 Fortunately, the Snow Leopard Conservancy had already established a livestock insurance program in this village, and the farmer who lost the yak was a participant. He would be reimbursed in full for the loss. Over three days, I had a total of 12-15 hours with the snow leopard. The last time I saw her she stood in very beautiful evening light, looking right at me, and teary eyed, I said thank you to her and to everyone who helps protect the snow leopard. For me, the snow leopard represents that precious part of ourselves – mystical and often hidden from the world – that holds great power. Spending time in her world and finally seeing her was like a dream that continues to empower me. The Grey Ghost needs our very practical protection so that she can continue to inspire our souls.